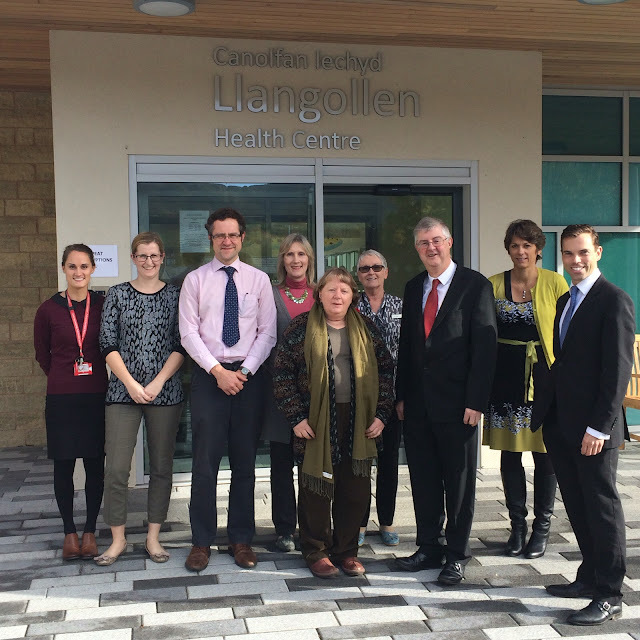 staff at the opening of Llangollen Health Centre. Clwyd South Assembly Member Ken Skates has issued a statement about why he's decided rule himself out of the Labour leadership contest and why he's decided to back his colleague Mark Drakeford instead. When considering the question of whether I wanted to stand as the next leader of Welsh Labour, the question foremost on my mind was that of purpose. Could I achieve what I want to do as an elected member of the Assembly only from the position of leading Welsh Labour, with nobody else at the helm but me? After much careful thought, the conclusion I reached was that this simply wasn’t the case. With the right person leading both the party and the government, I feel it is entirely possible for me to be able to deliver the changes that I believe are necessary for us to be a more tolerant, contented, healthier and compassionate nation. This led me to consider what it is I would want from a leader that I’d be happy to support. It would have to be someone with a positive, internationalist and inclusive view of the world. Someone determined to lead a fellowship of progressive hearts and minds against the backdrop of a looming Brexit, with the ongoing impact of austerity biting deeper and with political upheaval around us leading to deep uncertainty. Taking all of these factors into consideration, I felt the right person had to be a positive, experienced and strong bridge to the future. Their qualities should include an inbuilt moral compass to guide us through the opportunistic, volatile politics of today. They should have a deep and demonstrable understanding of the threats and challenges posed by our exit from the EU. They should be able to unite people around positive change for the future where everyone can see the common purpose and, finally, they should have the emotional intellect to connect with people, as well as the intellectual capacity to process unprecedented challenges. Against that criteria I could only conclude that Mark Drakeford is that person and that I absolutely want to be a pillar in supporting his bridge to a better tomorrow. Another prime consideration was that of the future development of - and investment in - North Wales. I know Mark understands the need to address the concerns expressed over the divide between the North and the South and to ensure the North has a strong voice, as well as the ability to flex its own economic muscles. In an age when too many politicians feel they need to be dogmatically absolute and hysterically alarmist in order to be noticed, Mark offers a very welcome antidote - calm pragmatism, guided by clear and consistent principles. Finally, whilst I’m sure there are many people who’d argue personal ambition is good, Mark’s ambition isn’t for himself, but for others. That’s the sort of quality I look for in my friends and colleagues. It’s the same quality I want in the person at the helm of our party and government. On a personal note, Mark has been a brilliant comrade since I was elected. Through the good times and the tough - especially the latter - he’s given me support and superb advice. I’ve made some difficult decisions in my time in this particular portfolio but having the backing of Mark has often been critical in seeing them through. That’s another attribute I admire that is required in a leader, a calm determination to do what’s right, even when the wind of opposition and opportunism blows fiercely in your face. So, whilst my other colleagues each have great skills and abilities - hopefully I have a few too - it’s in Mark that I see the best example of a leader who can steer us through the storm ahead. Brexit is the big issue of our age and Wales needs a captain to see us through it safely.